Summer is here! Well, not officially until June 21st, but tell that to the thermometer! 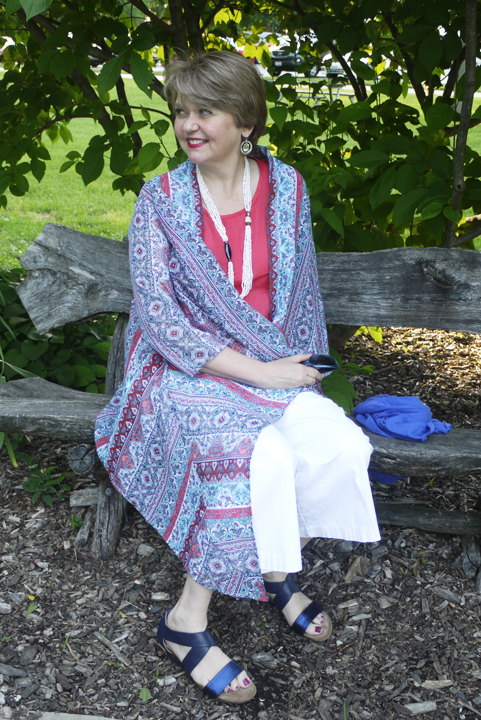 I've been sewing up a few things for summer and I wanted to share with you a couple of ideas for cover ups to keep you warm in air conditioned offices and stores, or on chilly summer evenings, when you just need a little something over your shoulders and arms. 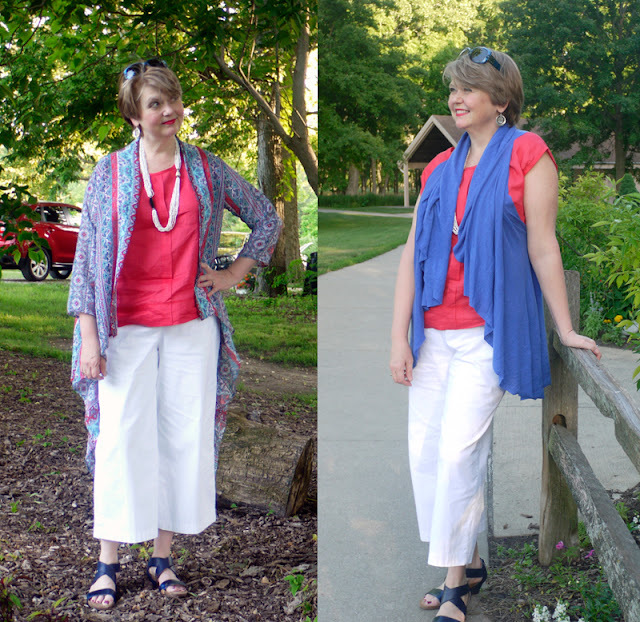 One is a dramatic, dressy waterfall cardigan made from chiffon, and the other is a very casual no-sew knit cover-up. So, depending on your mood or the occasion, you might like both! 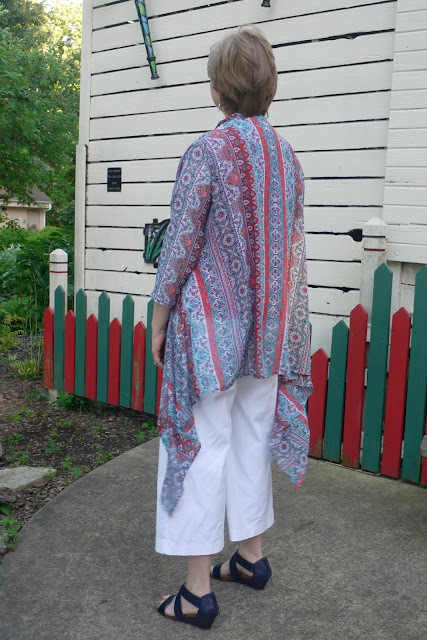 I made this waterfall design cardigan using a polyester chiffon stripe from Fabric Mart's chiffon section, and McCalls 7029 as my pattern. Fabric Mart always has a fantastic selection of chiffon! 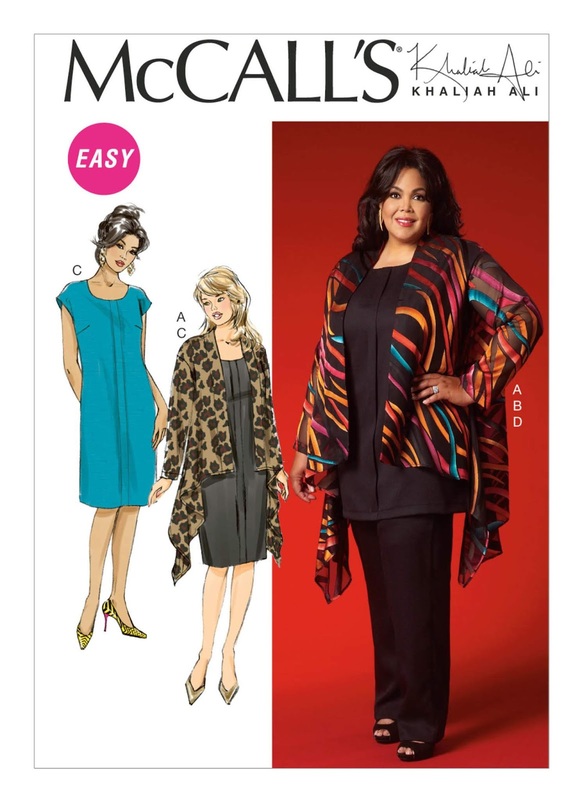 If you've never worked with chiffon before, I would recommend starting with something that doesn't have a lot of seams. A kimono type pattern with no set in sleeves would be a great project for a first time chiffon project. I chose this pattern because I really liked the drama of the extra long drapes on the side. It was a windy day when we were taking pictures, so you can get a glimpse of how chiffon moves in the wind. This pattern does have a center back seam, so be careful how you lay it out, if you are using a striped design like I did. I chose to make my stripes go vertically, but you could easily have them go horizontally instead. This design takes a lot of fabric, about 3 yards. Luckily, polyester chiffon is usually very reasonably priced, so you need not spend a lot to make it. The side seams ended up at a diagonal, and even though mine aren't matched, I like the chevron effect there. 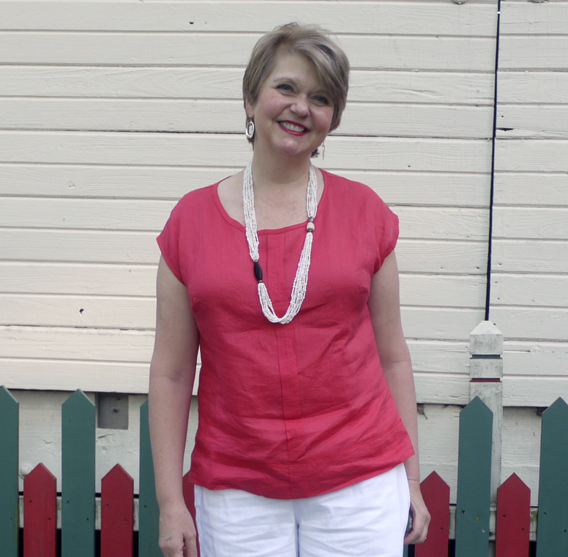 The pink top is also from McCalls 7029 and I made it from a watermelon handkerchief weight linen. I loved the color of it! But, I have to say that I'm not too thrilled with how it makes a significant crease right where my belly button is. Grrr. I am going to try just letting the whole thing crumple in the dryer and see if that makes the crease less significantly obvious. I may also make some vents at the side seams, so that it doesn't pull so much when I sit. I am open for suggestions if you have any ideas! I made the wide legged crop pants from Simplicity 8056 using a cross-hatch cotton/lycra twill from the Italian Designer section. This fabric is divine! Everything that I've ever gotten from the Italian section has been such top quality, so although it is pretty empty right now, don't forget to check it out now and again! 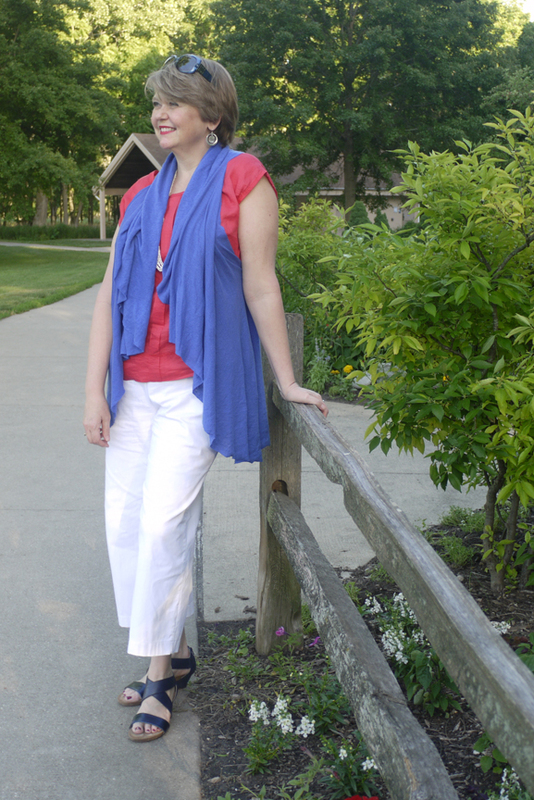 And I do like the wide legged crop style of these pants. I also wanted to share this no-sew knit wrap that I thought was quite ingenious. 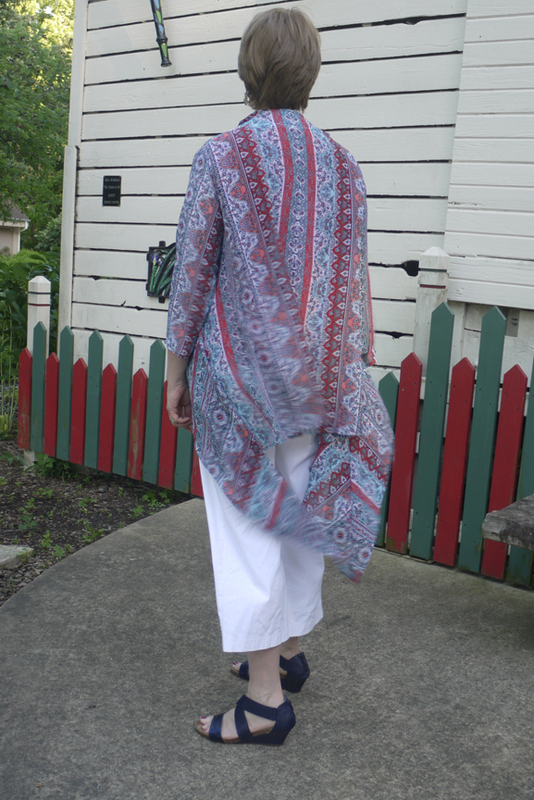 I made it from a linen knit that I bought last year. I got the idea from watching Peggy Sagers on Silhouette patterns' You Tube videos, which are really entertaining and informative. To make it, you fold a 1-1/2 yard piece of knit fabric first in half widthwise, and then fold one more time lengthwise so that you have 4 layers. 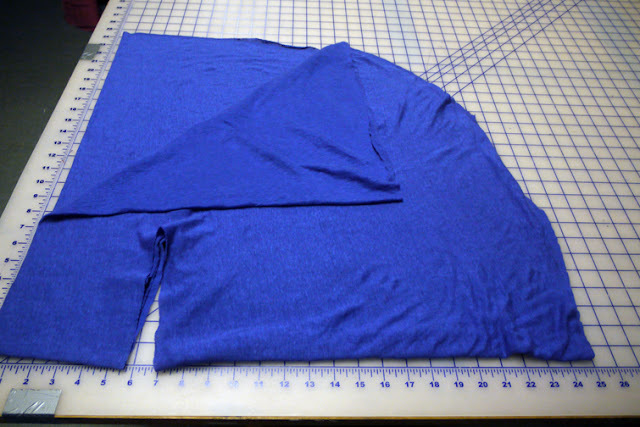 Measure six inches away from the double fold layers and make a six inch slash in your fabric through all layers. These slashes will become your armholes. Then, mark and cut a 1/4 of a circle on the unfolded edges through all layers. You can make this any size that you want- I cut mine at 24". 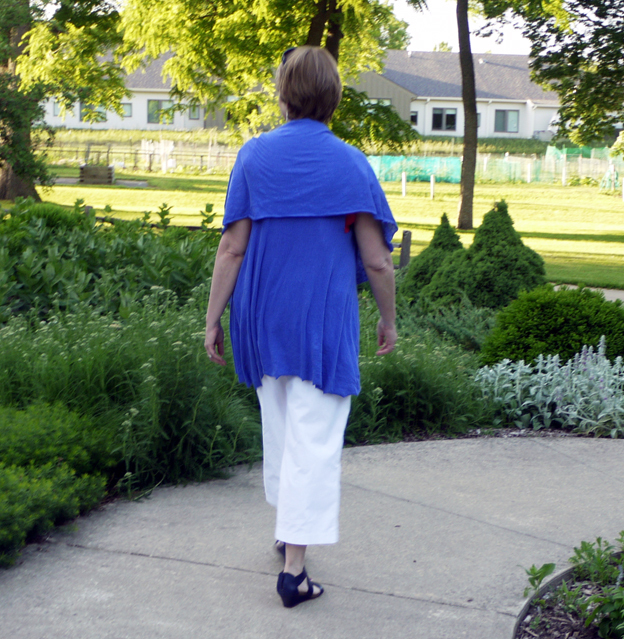 Unfold and you have a circle shape with two slits for your arms. And that's all there is to it! You can leave it unfinished like I did, or serge finish your edges. It's nice to wear either as a vest or like a shawl, and rolls up to a nice compact size if you want to carry it in a bag with you in case you find yourself in a freezing grocery store and need a little warmth. I hope that you have a great summer, and maybe sew up a cover up or two. I had a lot of fun making both of these! Great post, read it twice to be sure I had the details. 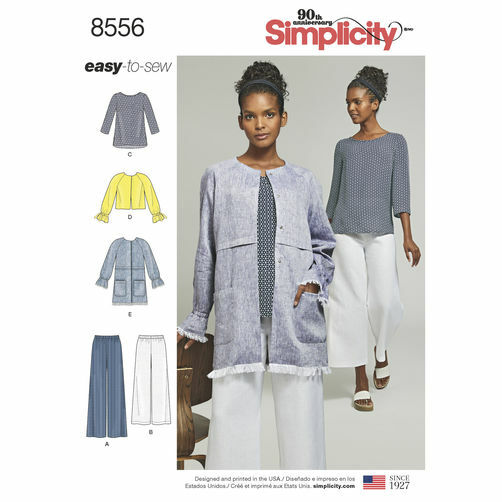 I love the pants and may try the chiffon number in some great rayon I got at Fabric Mart. The pants look like a win and I recently got the pattern. 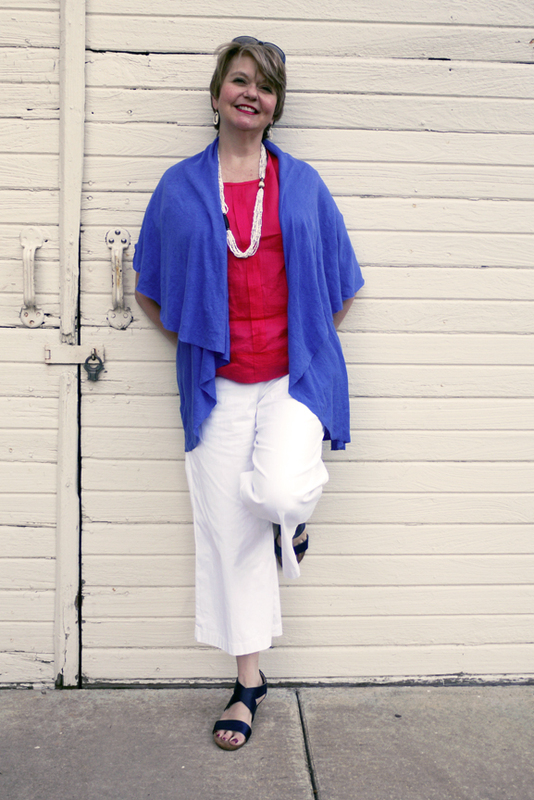 Your style has a classic ease that makes me want to get sewing. I always love seeing your coordinates Ann!